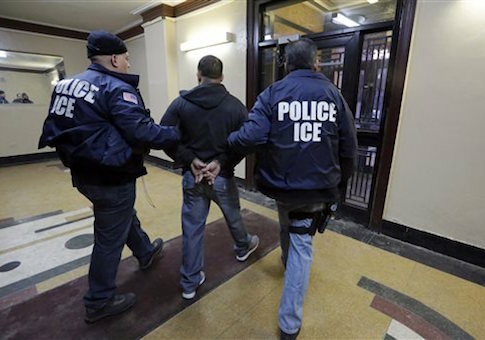 Immigration and Customs Enforcement (ICE) has doubled the number of arrests for undocumented immigrants without criminal records, and immigration arrests have risen by 32.6 percent under the Trump administration. Total immigrant arrests rose to 21,362 between Jan. 20 and March 13, from 16,104 arrests during the same timeframe last year. 5,441 of those arrests came from undocumented immigrants without criminal records, according to data requested by the Washington Post. ICE arrested 15 percent more immigrants with criminal convictions during President Donald Trump's first weeks in office than the same time period last year. According to the Post, the increase in arrests indicate that Trump is following through with his campaign promise to ramp up immigration enforcement from former President Barack Obama's more "protective stance." Trump said during an appearance on "60 Minutes" after he was elected that his immigration policy would prioritize removing criminal undocumented immigrants. This was a shift from what he said on the campaign trail, when he called for a stricter policy on all undocumented immigrants. ICE spokeswoman Jennifer Elzea reiterated Department of Homeland Security Secretary John Kelly's promise to apprehend undocumented immigrants regardless of their background. "As [Homeland Security] Secretary [John F.] Kelly has made clear, ICE will no longer exempt classes or categories of removable aliens from potential enforcement," Eleza said. But Elzea also emphasized that ICE "focuses its enforcement resources on individuals who pose a threat to national security, public safety and border security." ICE field offices in Dallas, Houston, and Atlanta each arrested more than 2,000 immigrants during the first weeks of Trump's presidency. Atlanta arrested the most immigrants without criminal records, while Philadelphia saw the biggest year-over-year increase in the number of noncriminal immigrants arrested. Despite this year's dramatic increase in immigrant arrests, the Obama administration arrested more undocumented immigrants (29,238) in the first weeks of 2014. It also arrested more roughly 2,000 more noncriminal immigrants than Trump's administration during that time. Those numbers dropped, however, after DHS issued a memo in November of 2014 committing to focusing its efforts on arresting criminals and those who recently crossed the border. The Trump administration also sought to deport more undocumented immigrants, although the overall number of deportations fell by 1.2 percent. Meanwhile, ICE detainers rose by 75 percent to 22,161. An executive order signed at the beginning of Trump's administration mandated that ICE will publish weekly information on detainers and list US jurisdictions that refused to comply with them. This entry was posted in National Security and tagged Border Patrol, Donald Trump, ICE, Illegal Immigration, Immigration Reform. Bookmark the permalink.